Thirty years is a long time and if you are old enough, 1986 may have some strong memories. There were the tragedies of the space shuttle Challenger explosion and the nuclear meltdown at Chernobyl in the Ukraine but also for some, the thrill of the Chicago Bears winning the Super Bowl in a blowout 46 to 10 and the New York Mets taking the World Series 4 games to 3. Both coincidentally beating Boston area teams, the Patriots and Red Sox. In our game there were some interesting things going on as well. Future Hall of Fame member Pat Bradley won three majors on the LPGA Tour and on the men’s Tour the U.S. Open was won by 44-year old Raymond Floyd also a future inductee to the Hall of Fame. But who can forget the other win by an “old guy?” At the age of 46 without a Tour win in two years and major championship in six Jack Nicklaus gave us one for the ages. His victory in that year’s Masters is still considered to be the greatest ever. Fans watching the last nine holes that April Sunday could share the emotion the Golden Bear must have been feeling…and talk about performing under pressure! 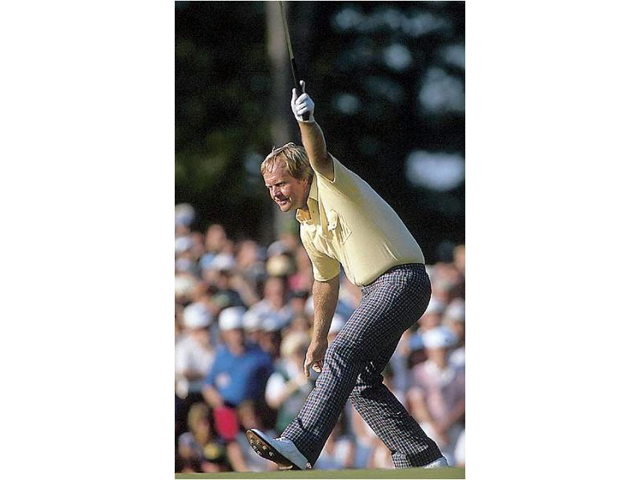 It’s been 30 years and still the nervousness, excitement and finally the elation when Nicklaus took his sixth Masters and 18th major championship is very real. There are dozens of stories about what happening that day including the legend of Nicklaus’ putter, a Clay Long-designed MacGregor Response ZT 615, that compared with the then popular models looked like a kitchen utensil or maybe a garden tool. MacGregor took orders for 5,000 the Monday morning following. [McCollister was] announcing the demise of Jack Nicklaus, golfer. According to this piece I was finished, washed up, kaput, the clubs were rusted out, the Bear was off hibernating somewhere, it was all over and done with, forget it, hang ‘em up and go design golf courses or whatever. A clipping of the offending column stayed pasted to the rental house refrigerator courtesy of Nicklaus’ longtime friend John Montgomery and was undoubtedly a strong “I’ll-show-‘em” incentive each time Nicklaus passed. His play on the back nine Sunday has taken on almost mythic status, written and talked about by commentators from Herbert Warren Wind (“nothing less than the most important accomplishment in golf since Bobby Jones’ Grand Slam in 1930”) to yours truly. However, Nicklaus himself points out the back nine charge of six under par wouldn’t have mattered if he hadn’t had some incredible luck on the eighth hole. His drive on this steeply uphill par-5, known as Yellow Jasmine, was pushed slightly and wound up right of the fairway laying on pine needles with several trees blocking the route forward. The prudent play would have been to pitch back to the fairway, however at that point being even par for the round Nicklaus knew unless he started scoring better the tournament was out of reach. Definitely a higher risk shot was called for. There was a small opening that a perfectly struck shot might sneak through and with a slight fade the ball would miss the first two trees immediately in front of him and, if it stayed low enough long enough, others closer to the fairway. But he also could tell, if the ball wasn’t hit perfectly it was anybody’s guess where it would wind up and a bogey or worse a very real possibility. With three wood in hand and taking his time he aligned the shot carefully. But when Nicklaus struck the ball though on the center of the clubface it started slightly right of the opening at which he was aiming, narrowly missed the first tree trunk and just barely passed through an even smaller gap in the branches. The ball did stay low though and curved further right to finish near the edge of the green, just the spot you want to be if you’re going to miss the putting surface,. A pitch and two putts secured his par and gave Nicklaus the emotional boost from escaping potential disaster that set the stage for a seven under par run over the next ten holes for a final score of 65. Thirty years ago it seemed fantastic…it still does today.